The ECS4110 Series includes high-performance Gigabit Ethernet L2 access switches with 56/104 Gbps switching capacity. 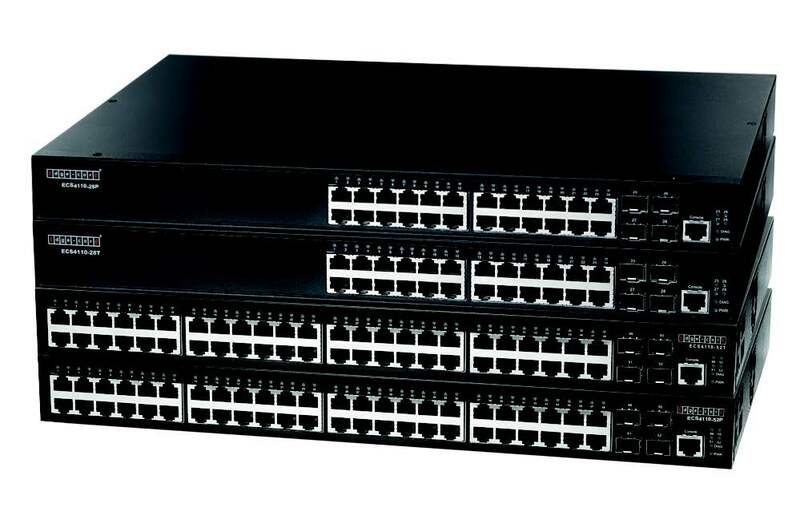 The switches deliver wire-speed switching performance on all Gigabit ports, taking full advantage of existing high-performance PCs by significantly improving the responsiveness of applications and file transfer times. The IEEE 802.1w Rapid Spanning Tree Protocol provides a loop-free network and redundant links to the core network with rapid convergence, ensuring a faster recovery from failed links and enhancing overall network stability and reliability. The IEEE 802.1s Multiple Spanning Tree Protocol runs STP per VLAN base, providing Layer 2 load sharing on redundant links. The ECS4110 Series supports IEEE 802.3ad Link Aggregation Control Protocol (LACP). It increases bandwidth by automatically aggregating several physical links together as a logical trunk and offers load balancing and fault tolerance for uplink connections. egress queues per port enable differentiated management of up to four traffic types across the network. Traffic is prioritized according to 802.1p, DSCI, IP precedence and TCP/UDP to provide optimal performance for real-time applications such as voice and video. Weight Round Robin (WRR) and strict priority ensure differential prioritization of packet flows and avoid congestion of ingress and egress queues. The ECS4110-52P can provide up to 30 Watts of power to attached devices, such as VoIP phones, wireless access points, surveillance cameras, etc, all over existing Cat. 5 cables. The switch can deliver up to 30 Watts on 13 ports, 15.4 Watts on 25 ports, or 7.5 Watts on 48 ports. PoE eliminates the need for individual power sources for devices in the network, saving on costs for power cables and avoiding power outlet availability issues. If the power demand exceeds the switch’s maximum power budget, ports can be prioritized to receive power. Port Security limits the total number of devices using a switch port and protects against MAC flooding attacks. IEEE 802.1X port-based or MAC-based access control ensures all users are authorized before being granted access to the network. When a user is authenticated, the VLAN, QoS, and security policy are automatically applied to the port where the user is connected, otherwise the port is grouped in a guest VLAN with limited access. Secure Shell (SSHv1.5/v2.0) and Secure Sockets Layer (SSL/HTTPS) encrypt Telnet and web access to the switch, providing secure network management. Dynamic ARP Inspection (DAI) is a security feature that validates Address Resolution Protocol (ARP) packets in a network. DAI allows a network administrator to intercept, log, and discard ARP packets with invalid MAC-to-IP address bindings. Ethernet standard to make efficient use of the Ethernet ports, they also detect link status and cable length, powering down when a port is not connected and reducing power for shorter cables.